Understanding the viscosity, or thickness, of batters can help optimize them and the final product. A fluid with higher viscosity would pour slowly and seem thicker than a fluid with less viscosity. For example, water would have a lower viscosity than cake batter. Centipoise (cP) is the standard unit of measure for viscosity in the USA. MilliPascal*seconds is the common unit in other countries. 1cP = 1mPa*s.
Newtonian fluids do not change viscosity with shear. This means that a plot of shear stress versus shear rate at a given temperature is a straight line with a constant slope that is independent of the shear rate.2 Examples of Newtonian fluids are water, air, and ethanol. Psuedoplastic – a material’s viscosity decreases as the shear rate increases. This type of flow behavior is sometimes called shear-thinning.1 Cake batter, agar-agar and fruit juice concentrates are examples of psuedoplastic foods. Dilatant – a material’s viscosity increases as the shear rate increases. This type of behavior is sometimes called shear-thickening. 3 Corn starch mixed with water and candy compounds are examples of dilatant foods. Thixotropy – a material’s viscosity decreases when sheared at a constant rate over time.1 Yogurt, pea protein and water, and honey are examples of thixotropic foods. Rheopexy – a material’s viscosity increases when sheared at a constant rate over time.1 Cream to whipped cream is an example of a rheopectic food. Understanding viscosity can allow you to determine the best process and equipment needed for commercial production of your product.5 For example, “the ability to characterize the pseudoplastic behavior of the batter can pay dividends in more ways than one. 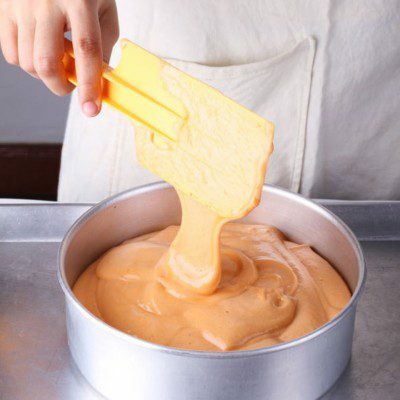 Processing the batter effectively in a production operation relates back to the viscosity issue. Thicker formulations are more difficult to move and handle in general. There may also be a correlation between the density of the baked product and the viscosity of the batter. McGregor, Robert. “Viscosity: The Basics.” Ed. Dorothy Lozowski. . Chemical Engineering. 1 Aug. 2009, pp. 34-39. www.chemengonline.com/viscosity-the-basics/?printmode=1 . Accessed 11 Jan. 2017. “What Is Viscosity.” Brookfield Ametek, www.brookfieldengineering.com/education/what-is-viscosity.asp#nonnewtonian. Accessed 12 Jan. 2017. McGregor, Robert. “Re: Viscosity” Received by Katie Jones, 2 Jan. 2017. Berta, Marco, Johan Wiklund, Reinhardt Kotzé, and Mats Stading. “Correlation between in-line measurements of tomato ketchup shear viscosity and extensional viscosity.” Journal of Food Engineering 173 (2016): 8-14.